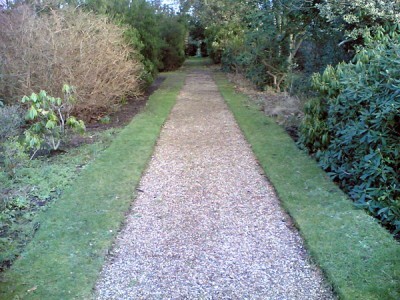 This is the view up the garden path (not mine). It’s now less than a month till Bob Sutton’s book comes out, and it is number 2 on the Amazon pre-order list (probably the US one). An excursion or outing involving the use of a train for part of the journey and a bicyle for the rest. This can be a group or solo activity. 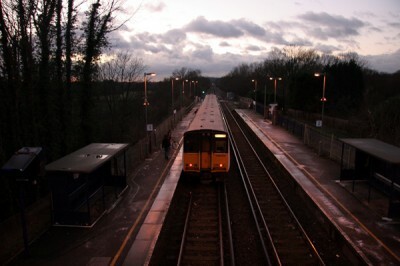 The train can be used to convey the cyclist/s to a good cycling location, or to remove the need for the cyclists to complete a circular journey solely by bicycle. Ok, the definition needs a bit more work. Once I have improved it I might try and put it on Wiktionary. Passengers on Southern trains are only allowed to take folding bikes on board. The move has been criticised by councillors in Brighton and Hove, a city named as a “cycling demonstration town” to promote the mode of transport. Members of the Cycle Train Commuter Group voiced their opposition at Brighton station on Monday morning. Spokeswoman Gaynor Hartnell said: “The way the trains are designed doesn’t really accommodate bicycles. Adding insult to injury there is very little information for cyclists on the Southern Trains website. There is more information at the UK Bike/Rail website, and it covers other operators too. A neologism is an invented or artificial word to fulfil a particular purpose. In the case of traicycling there is no obvious purpose. The M23 was planned as a means of relieving congestion on the A23 through Streatham, Thornton Heath, Purley and Coulsdon in south London. which is unfortunate because of course the M23 never made it that far North. And while I was wandering around scouting under bridges on the North Downs I missed The Big Story. Then again, so did Howard. 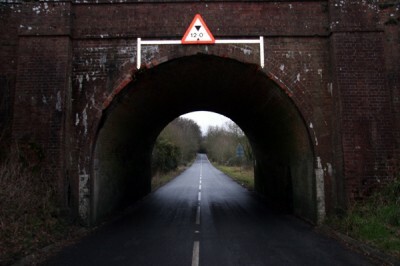 This brick bridge is part of the Redhill to Tonbridge railway line which opened as the Redhill to Ashford line. See Steve’s page (although his dates are somewhat confusing). 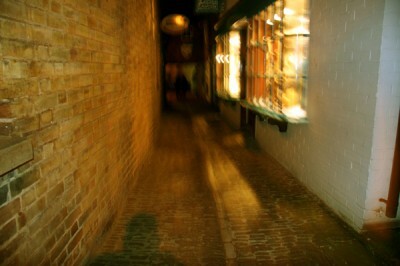 The bridge is a good example of Victorian brick architecture. 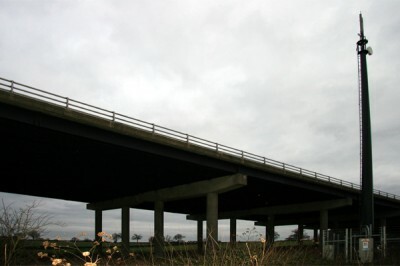 Presumably the bridge has been renovated as the road was widened over the years, although it still bears the scars of the tall vehicles whose drivers have tried to navigate under it. Bigblue likes his German rye bread or pumpernickel, which is not available in all supermarkets. 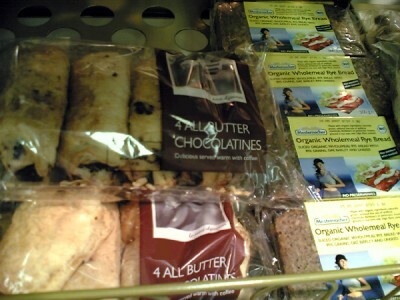 He spotted it in the large supermarket this week next to this pack of pain au chocolat but was taken aback to see these referred to as chocolatines. Bigblue thinks of chocolatines as something altogether different. So it was with surprise that he found that, according to Wikipedia, a pain au chocolat is also called a chocolatine in certain regions of France. Bigblue doesn’t like the usage of chocolatine as with this version of the name all the consonents are pronounced. 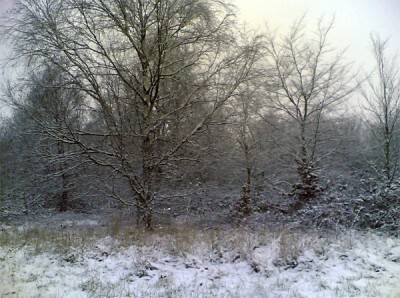 Did I mention that we had some snow this week? Apparently it wasn’t only me that bunked off work on the “snowday”, the dusting of snow brought chaos to our travel network. 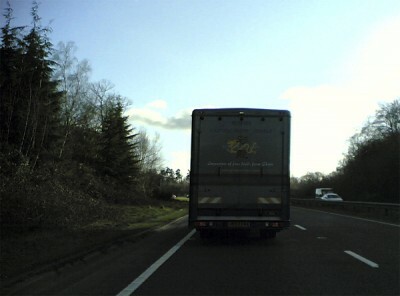 Spotted on the roads in Kent, the back of this horse truck warns that live horses are being transported, contains the picture of a dragon, and then advertises itself as an importer of fine foods from China. I have seen horse meat for sale in supermarkets and restaurants in France and Switzerland but I don’t think it will take off in this country. It’s a strange combination of words and image, but as far as I know Ginger Dragon don’t sell horse meat anyway. In unrelated news, the 17th Gyalwa Karmapa, Orgyen Trinley Dorje (who currently resides at Gyuto Monastery in India) has issued instructions to his followers not to eat meat. Give up eating meat for a specified period of time such as one, two or three years. Reduce eating meat with a view to giving up completely. Reminds me of what I have run from. That living is for other men. Of how I loved and how I failed. These feelings should not be in the man. Martyn Smith of Old Roads writes of a literary trip to London: which he has entitled Traveling with Henry James: Consciousness and Association. Smith seems to see the history of London, lurking in the present and makes some some interesting comparisons with other writers, besides for Henry James and Blake, such as Wordsworth.